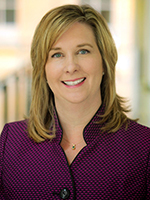 After a comprehensive national search, Lisa Nagy has been named vice president for Student Affairs. Nagy previously was senior associate vice president of Student Affairs and has served as the division’s interim vice president since the spring of 2017. LEARN MORE. College-based clinics and labs—The Math Clinic, Writing Center, and others are here to help. Check with each for details. SHAC Spa Retreat—Enjoy free snacks, chair massages, and other stress-relieving activities. 10 a.m.-2 p.m. Wednesday, Dec. 6, Palo Duro Lounge, University Center. Coffee for Finals—Free for students. 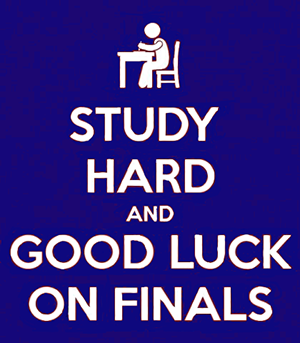 9 p.m.-closing through Friday, Dec. 15, the Architecture and Fine Arts Library and the Science and Engineering Library. Paws for Finals—Therapy dogs can help relieve study stress. Noon-2 p.m. through Friday, Dec. 8, and Monday-Wednesday, Dec. 11-13, basement, Central Library. Late Night Breakfast—Fuel your study time. 9:30-11 p.m. Monday-Tuesday, Dec. 11-12, Connection Cafe, University Center. 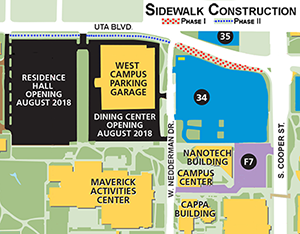 Pedestrians should be prepared for sidewalk construction along UTA Boulevard. The first phase of the 6-foot-wide pavement is on the south side of the street between West Nedderman Drive and Cooper Street. Walkers can use parking lot 34 to reach Cooper. The second phase begins Tuesday, Dec. 12, between West Nedderman Drive and Kerby Street. Gather your friends and family and join thousands of others in downtown Arlington for the Arlington Holiday Lights Parade at 6 p.m. Saturday, Dec. 9. The grand marshal is UTA's men's head basketball coach Scott Cross. UTA's festive float will feature Blaze and a host of spirited students and will be followed by the UTA Marching Band. The pageantry will end with the lighting of the Christmas tree on the steps of City Hall. The UTA Police Department seeks your opinion regarding its performance in serving the community. The UTA PD survey will remain open until Dec. 8. Your time and input will help the UTA PD enhance its professionalism and services provided to students, faculty, staff, and visitors. LEARN MORE. Send a photo of your decorated graduation cap for a chance to win one of three prize packs sponsored by the UTA Bookstore. Submit photos to socialmedia@uta.edu by 11:59 p.m. Wednesday, Dec. 13. Be sure the submission includes your name, major, and what your cap design means to you. Vote for your favorite on the UTA Facebook page. Winners will be announced Monday, Dec. 18. Full contest details are available on the UTA social blog. December graduation candidates should visit the Commencement website for details on ticket quantities and availability. If you experience technical difficulty claiming your tickets, contact the Box Office at 817-272-9595. Commencement ceremonies are Thursday-Saturday, Dec. 14-16, in College Park Center. All ceremonies will be livestreamed through the Commencement website. Take precautions against flea-borne typhus, which is on the rise in Tarrant County. Twenty-two cases have been reported this year, according to the Tarrant County Public Health office. Flea-borne typhus, also known as murine typhus, is a bacterial infection treated with specific antibiotics. LEARN MORE. Dec. 8—Friends of the UTA Libraries present Manny Triana as Elvis!